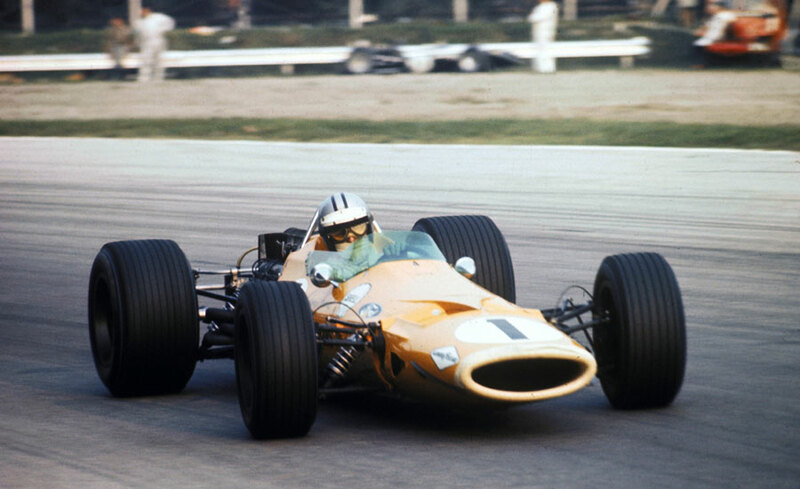 Defending champion Denny Hulme secured his first win of the season with victory at the Italian Grand Prix, a result which, thanks to his steady accumulation of points in other races, lifted him back into the championship hunt. Graham Hill and Jackie Stewart, who were leading the table, both failed to finish. There was controversy at Monza before the race day when Bobby Unser and Mario Andretti were banned from taking part after it was revealed they had flown back to the USA to take part in the Hoosier 100-Mile Race and were planning on rushing back on an overnight flight in time for the grand prix. The stewards invoked a rule stating no drivers could take part in another race within 24 hours of a grand prix. It left BRM - with whom Unser, the Indianapolis 500 winner, had just signed - and Lotus a driver down. Thirteen drivers broke the lap record in practice, John Surtees the quickest of them all in his V12 Honda. The race itself took place in searing heat and only six of the 20 starters lasted the distance. The 100,000 spectators were treated to a ding-dong battle during which the lead swapped 15 times. Bruce McLaren was the early leader, initially chased by Hill, and when he retired after losing a wheel, by Stewart, Hulme and Jo Siffert as they tore round with only a few car lengths between them. Surtees' day ended on Lesmo Curve when he collided with Chris Amon, who had skidded on oil. Amon's Ferrari jumped the guard rail but he escaped unhurt. By the halfway point Hulme was half a car length ahead of Stewart - McLaren's engine had given up and soon after Stewart coasted into the pits in a similar state. From then on Hulme extended his lead with Jacky Ickx and Siffert unable to respond. Ickx moved his Ferrari into second, to the undisguised delight of the crowd, when Siffert's rear suspension broke, and then fought off a challenge from Johnny Servoz-Gavin. As the pair of them raced for the line almost a minute-and-a-half behind Hulme, Ickx's engine spluttered and Servoz-Gavin darted out from his slipstream to pip him to the line. The result meant Hill, whose 100th grand prix start had been forgettable, still led the championship with 30 points, three clear of Ickx with Stewart one behind him and Hulme a further two adrift.